Kuah is just a small town with less than a dozen eateries at night. One of the popular Chinese-style restaurants here is Wonderland Food Store (欢乐天饮食中心). According to locals, this restaurant is a tourist trap because the vast majority of its customers are tourists. But in the absence of alternatives, I decided to give this food establishment a try. The first dish for dinner is Fried Squid (香脆炸墨鱼, RM10.00). Coated with crispy batter, the squid rings are fairly enjoyable. I also find the Ginger & Spring Onion Chicken (姜葱鸡, RM10.00) to be reasonably tasty. Meanwhile, Fried Mixed Vegetable (炒杂菜, RM10.00) comprises of cauliflower, baby corn, carrots, choy sum (菜心), cabbage and water chestnuts. In lieu of rice, I opted for Fried Bihun (炒米粉, RM5.00). Rice vermicelli is cooked with chicken, egg, choy sum and bean sprouts. Fresh Orange Juice (橙汁, RM3.50) is my choice of drink. 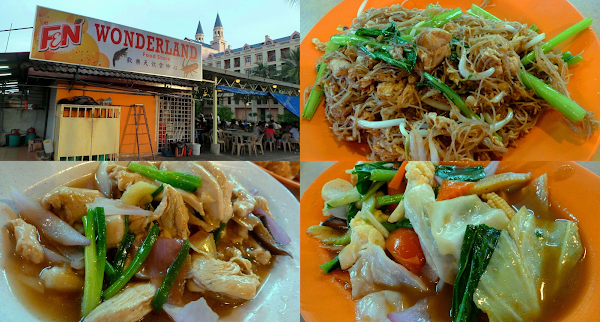 Overall, the food at Wonderland Food Store is acceptable, but don't expect major surprises in comparison to typical roadside stalls in Penang. The food menu is pork-free but beer is available.